Google unveiled the Pixel 2 and Pixel 2 XL in San Francisco today. The phones are pretty much what you would expect from any new Android phone (check out our coverage). One rumor that Google confirmed at the event was that it would follow Apple’s example and eliminate the 3.5mm headphone jack. Of course, both versions of the flagship phone will come with a 3.5mm to USB-C adapter packed in the box and USB-C headphones. However, Google is hoping you’ll spring for its new wireless Pixel Buds instead. Google's wireless earphones are similar to Apple's AirPods in some respects. They have sightly better touch controls (swipes for volume, tap to play and pause, hold to activate Google Assistant). They also come with a carrying case that serves as a charger. However, unlike AirPods, Pixel Buds are attached by a cloth cord, which serves multiple purposes. One function of the cord is to prevent the earpieces from getting lost should they fall out. If one earphone slips, it will never hit the floor. If both of them pop out, the cord is going to make them less likely to take a wild hop into an unreachable area like under the refrigerator. They will also be easier to find in the grass or other obscuring materials since the cord will make them more visible. And of course, it is much more convenient to drape them around your neck when not in use than it is to fish the case out every time you need to take them out. The primary purpose for the cord though is to keep the phones in your ear. 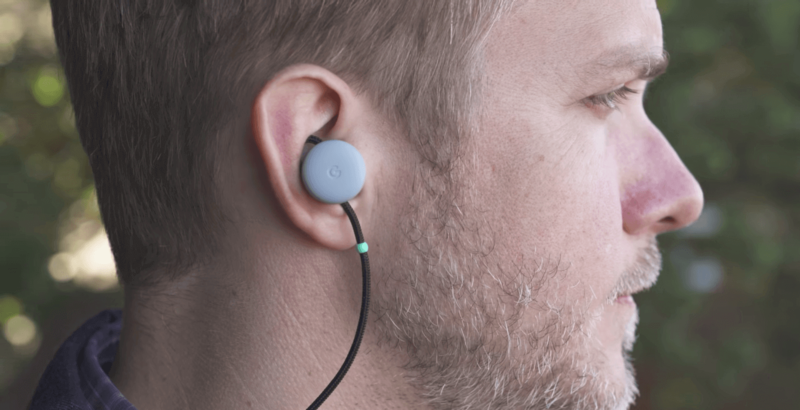 Pixel Buds are not your typical earbuds that you jam into your ear and hope that they stay. Instead, they rest on the outside of the ear, and the cord juts out the top of each earphone making an adjustable loop. You adjust this to fit snuggly into the crease of your outer ear (see top picture). So the cord is what keeps the buds in place. Like Apple’s AirPods, Pixel Buds are not cheap. They will retail for $159, which is the same price Cupertino charges for its wireless phones. The buds will come in three colors – white, gray, and black. They also come with a cloth covered carrying case that also serves as a portable charger for the headphones. The set can run for about 4 hours before needing to be recharged, and the case is supposed to be good for up to four charges. Google does not have a specific release date set for Pixel Buds, only saying that they will be shipping in November, but pre-orders are available as of today.